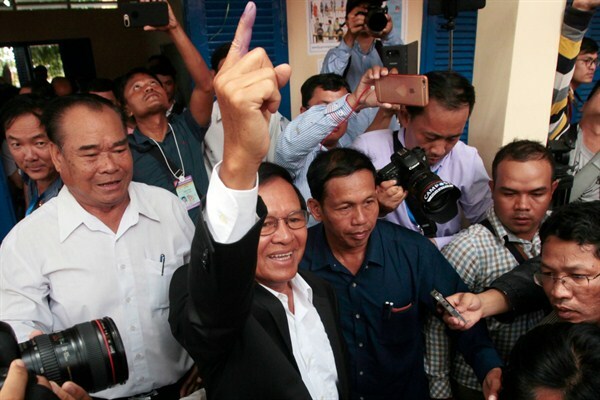 Kem Sokha, a Cambodian opposition leader who was arrested earlier this month, shows his inked finger after voting in local elections on the outskirts of Phnom Penh, Cambodia, June 4, 2017 (AP photo by Heng Sinith). A chill has settled over U.S.-Cambodia relations. Since the start of the year, Cambodia’s pugnacious prime minister, Hun Sen, has canceled a planned bilateral military exercise, kicked out a U.S. naval engineering battalion working on charity projects, and assailed Washington for refusing to cancel a $500 million war debt from the early 1970s.